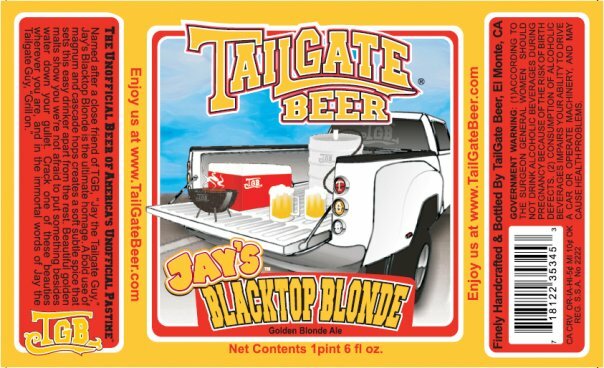 Tailgate Brewing – Tailgate Jay’s Blacktop Blonde – 12 oz. bottle poured into a pint glass. 5% abv. This is a small test pilot batch, that may be distributed in bottles in the near future. Appearance: Pours a clear, slightly amber yellow gold with a 1/8 ring of white at the top. This beer is very active, with champagne levels of carbonation. Aroma: Whiffs of bready buscuity malt. Taste: A mixture of bready flavors of very mild bitter hops. Mouthfeel: Full bodied and rather crisp. Overall: This beer is completely non-offensive, and well made. We always go for the big, unique and bold, but we know a well made session beer when we drink one. I just had this beer at a steakhouse last night. I think it may be the best beer I’ve ever had. I want to know where I can buy it!